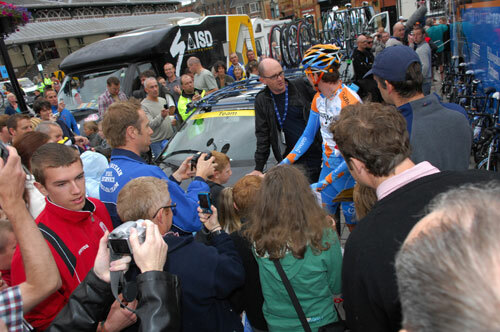 Wiggins helped Garmin-Slipstream team mate Chris Sutton in the hectic finish on the Blackpool promenade. He avoided the crash with 500 metres to go and finished 29th. After getting changed and putting some food in his pocket, he was back on the bike and already focused on beating big rival Fabian Cancellara in next Thursday’s time trial in Mendrisio (September 24). “It’s just over a week to the world championships and I don’t want to take any risks. I’ve got to keep the bigger picture in perspective and save my mental energy for one last big effort,” Wiggins told Cycling Weekly. Wiggins will recover at home and do some final time trial training before flying out to Switzerland at the weekend. “I’m doing everything right with my build up because I really do believe I can get a medal,” he told Cycling Weekly. Wiggins and Chris Froome are set to ride the men’s time trial for Great Britain on Thursday. GB’s nine-man team for the road race (Sunday, September 27) will be selected on Friday.